View of an open pit gold mine. “A mine is a complex space of flows” says Dr. Mostafa Benzaazoua. I’m not expecting a professor of geological engineering to use a phrase from the media studies cannon. I write in my notebook” “maybe media studies before mining science?!! !” Or perhaps that phrase has now entered into everyday scholarly parlance. Over the course of the next few hours, Dr. Benzaazoua gives us a detail-rich lecture on how gold is mined from the earth, and the spaces of flows the mine and its products inhabit. The next day we leave before dawn to visit Canada’s largest open pit gold mine. 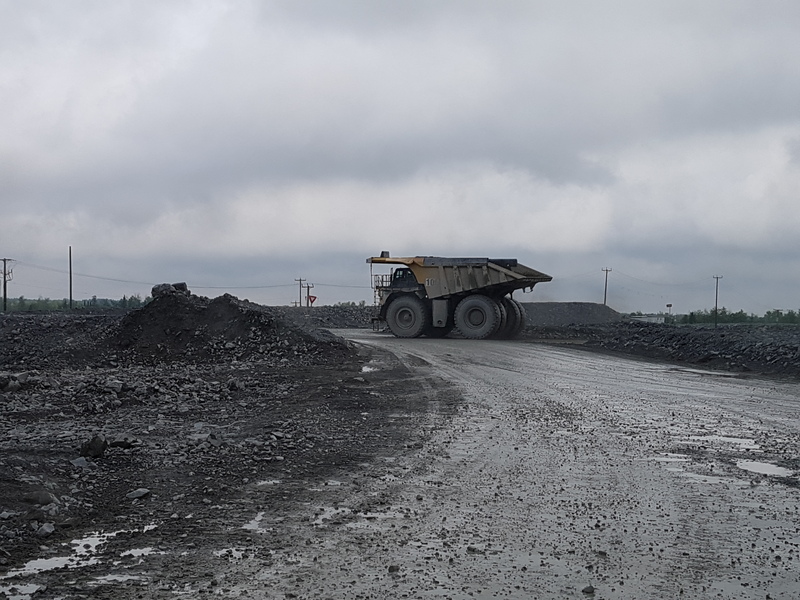 This post is a report on a visit to a large scale extraction facility, and its relationship to studies of infrastructure and technology. The visit contributes to my own (ongoing) research on machine learning, accountability and ethics; in this I argue that narratives of ethics and accountability are in fact about the evolution of measurements and standards for regulating and assessing human and non-human systems working together. This visit was organised as part of a Summer School called Planetary Futures conceived and led by Drs. Orit Halpern, Pierre- Louis Patoine, Marie-Pier Boucher and Perig Pitrou, and hosted by the Milieux Institute for Art, Technology and Culture at Concordia University. Over the two weeks following the visit to the mine we journey – literally and figuratively – to the following places: a Mohawk reservation; waterways that enabled the development of the US and Canada as settler-colonial states; the Buckminster Fuller-designed Biosphere from Expo 67; Moshe Safdie’s Habitat 67, an architectural vision for future housing in crowded cities; a future ‘village’ on the Moon to be built by various Space agencies; the SF of Ursula K le Guin, J.G Ballard, and Peter Watts; and the work of Sarah Sharma on critical temporalities, and notions of ‘exit’ among others. 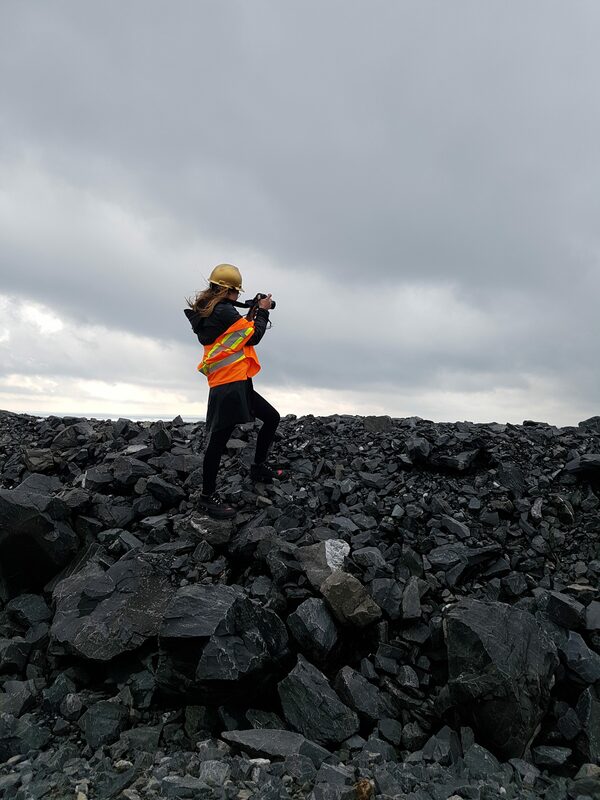 When you visit an open pit gold mine, it takes time for your eyes to adjust to the grayscale landscape. More lunar than Luxor, you don’t see anything even remotely golden at a gold mine, except perhaps the cheesy gold hard hats (we) visitors wear. We are watching the open pit of the mine from a viewing gallery many metres away and above it; it is very, very quiet here. You expect to hear something, but we’re too far away to hear the machines drill the earth and bring up rocks, which are loaded into large trucks. 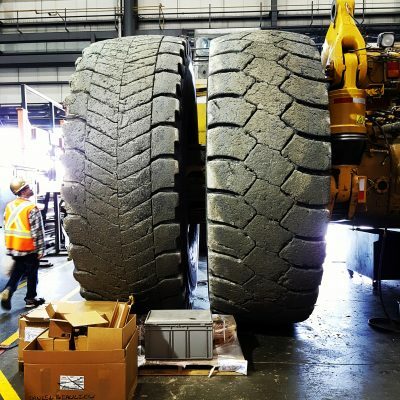 Each truck has eight wheels, each wheel costs $42,000 and is about ten feet high. The trucks lumber about like friendly, giant worker-animals. To drive them requires significant skill; we are told that women make better drivers. The trucks take the rocks away to the factory where they are analysed for gold. Someone says something later about the mine being cyborg: the organic Earth, with its transformative automated elements – the drilling machines, trucks, – and the ‘intra-action’ of the two being the mine itself. Inside the gold mine’s factory facility. Each wheel costs CA$42,000 and is ten feet high. A big truck that conveys rocks dug up from the mine pit to the factory for processing. There is something hypnotic happening here. Standing in the light drizzle, the only colour comes from the yellow of the school bus that brought us here, and our safety jackets. We can’t take our eyes away from the pit. Many people are recording video and we are all taking pictures. It is as if we are waiting to see something important or extra-ordinary, as if something special might emerge because we’re looking at it. I thought about gold for longer than I ever have in my life in those 30 minutes watching machines work the Earth: the symbolic and socio-cultural value of gold (particularly for Indians); the relationship between gold and finance; the Gold Rush and the Wild West; value; how ‘gold’ enters the vocabulary from ‘gold digger’ and ‘bling’ to ‘gold watch’, to anything prefixed by the word ‘golden’. Time passes, and nothing happens. It is not actually hynotic, I realise; it is meditative in the sense that it is oddly absorbing and empty at the same time. This is just another day in a gold mining factory however. The longer you watch, the more apparent it becomes why the study of infrastructure is infused with a certain poetics. Sulfide-rich ores like pyrite sometimes contain gold, and are found here along with chalcopyrite, which is a significant source of copper. Pyrite is also the technical name for Fool’s Gold. The ores dug up from the ground must be analysed by spectrometric techniques, the gold identified and eased out through chemical processes, and the waste rocks dumped and re-used elsewhere. ‘Tailings’ are the waste rock that do not contain any gold and must be recycled for other uses in the factory. In many instances, tailings must be carefully managed, or re-used, to contain the negative environmental outcome of the mining process, particularly acid mine drainage: in other words, environmental contamination (Benzaazoua et al 2017). Confronted with the expanse of the waste that is the tailings field, it is sobering to realise how little gold comes out at the other end. All the gold that has ever been mined from the earth only fills two Olympic sized swimming pools, says the engineer showing us around. For so little, you have to do so much. We are thinking about the unthinkable, and the incomprehensibility of scales when it comes to the planet. 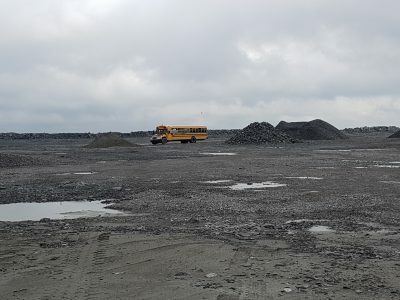 Pyrite tailings field with school bus to transport PhD students and Summer School faculty. We are close to what Thacker refers to as the ‘world-in-itself’ in his book on speculation, horror and philosophy, In the Dust Of This Planet (hat tip to Daniel Rourke for this reference here). The world we humans interpret and give meaning to, the world we relate to or feel alienated from, is the world-for us. But the world that already exists, that is somehow inaccessible, the one we turn into the world-for-us though inquiry and study, is the world-in-itself. Both the world for-us and in-itself coexist, paradoxically. Unfortunately the world-in-itself is the one we get to know through natural disasters, it is the world that “resists, or ignores our attempts to mold it”. He offers another valuable abbreviation. The world-for-us is simply what we refer to as ‘the World’; the world-in-itself is ‘the Earth’; and the world-without-us is ‘the Planet’. Being at the site of intensive extraction is to be somewhere between the world-in-itself and the world-without-us. 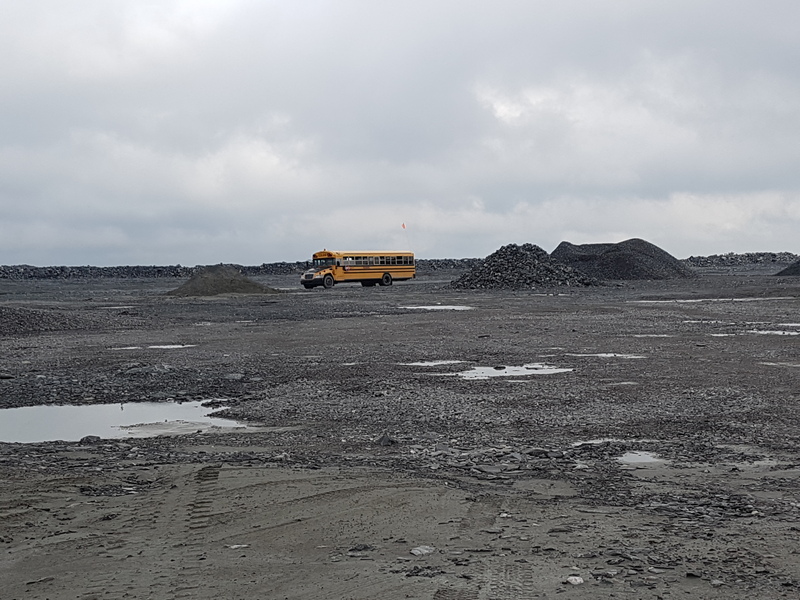 The pyrite tailings field is the one of the largest, most bleak landscapes I have ever experienced. The damp, windswept, grey day adds atmosphere. Perhaps this is what the surface of the moon might be like, or the world-without-us. End of the line. The last stop in the process of gold being extracted from the earth. Yet, we are back in the world-for-us before we know it. At the end of the tour we find ourselves in something pleasant and ominous; like a scene out of a Tarkovsky film, says someone in the group. Crystal clear water rushes out from a canal and disappears into a thickly wooded forest. It is quiet save for the sound of water. There is a whiff of pine in the air. It could not be more bucolic. Gold extraction requires chemical processes that contain numerous contaminants that must be washed away; this washing increases the acid level in the water. Carbon dioxide is pumped into the water to restore its PH balance. 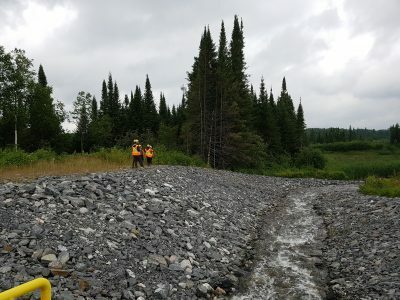 “There are moose in that forest” says the lead engineer at the mine. “We return to nature now” he says with a warm smile. Here, extraction seems to fit into some sort of pre-ordained, cyclical, natural order of things. One thread in the Summer School related to the application of ethnographic methods to the study of infrastructure. 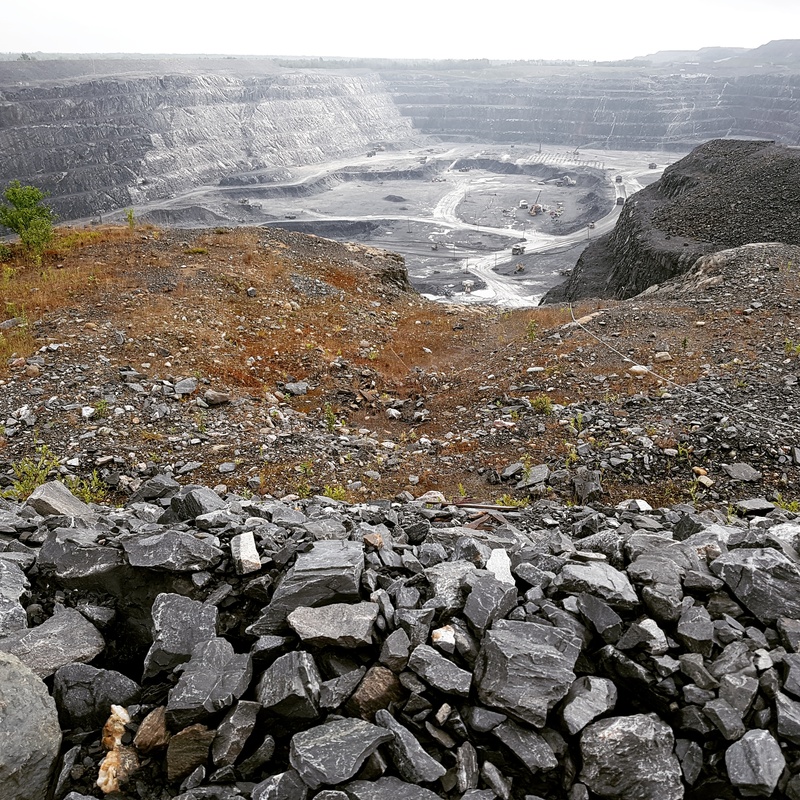 Through the visit to the mine and the towns around it, I kept a diary of us, of how we arrived in this place and started studying it, like anthropologists; and how we relentlessly document, communicate, and share. 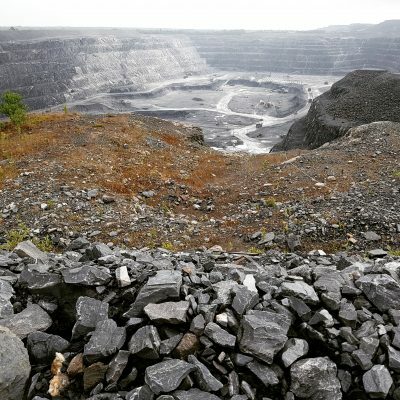 I posted a lot of photographs to Instagram right through the two weeks, and particularly about the visit to the mine. (Later, I put them together as a patchwork speculative story here.) We were (are) as much as part of the world-in-itself, transforming it into the world-for-us. Doctoral researcher documenting infrastructural processes. “Infrastructure is things, as well as the relationship between things” says Brian Larkin. There is a sort of well-meaning hubris intrinsic to infrastructure-mapping exercises: eventually, you are not going to capture every part of the system. There are some things about the mine that we cannot know till Mostafa tells us. 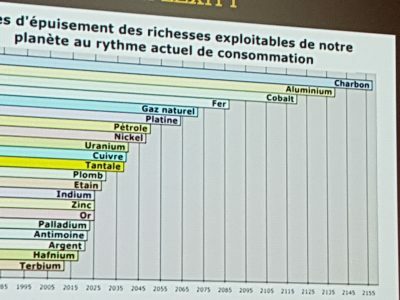 For example, the price of gold on the market affects the price of academic’s houses in the mining towns of Quebec. The town he lives in will shut down when the gold runs out. There is talk of trying to visit one of the towns nearby that is ‘dead’, following the closure of a mine because the gold dried up. Someone else feels uncomfortable with us engaging in disaster-tourism for academic extraction. Searching online, I find that one of the mining towns in the region has made a bid to be a Canadian Capital of Culture; they were rejected. I wonder if this is some soft of insurance for the future that will certainly come. One of the faculty tells us about how miners can be paid well, and so take out expensive mortgages and buy fancy SUVs. If the gold dries up, they’re out of a job overnight. Someone else tells us that the under-12 suicide rate here is significant. The space of flows indeed. 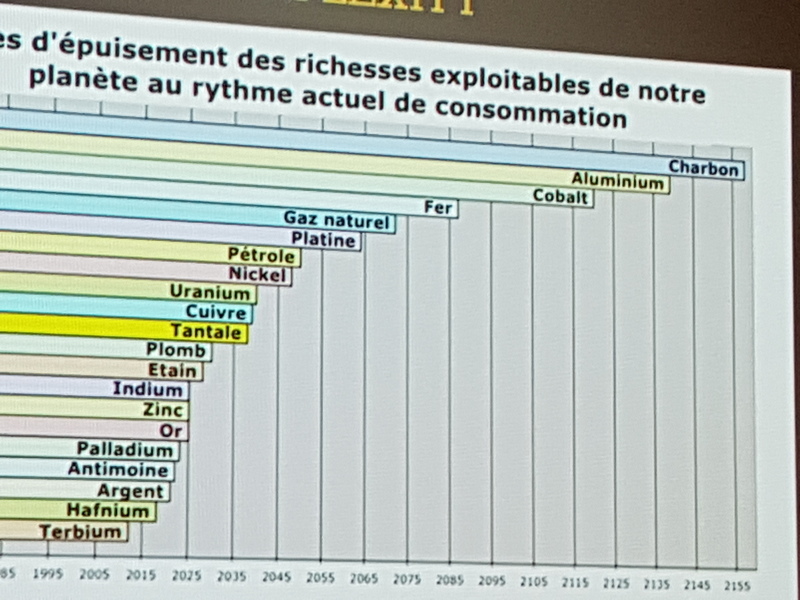 Slide from presentation by Dr. Benzaazoua describing when various resources mined from the Earth will run out. A phrase that pops up with annoying regularity these days is “data is the new oil”. The study of big data metaphors is already rich. Big data, and controlling big data, is gaining traction in terms of food and nutrition and the ‘data detox’ paradigm (Sutton, 2017). There is much written and being said about rights (or the lack thereof) to individual privacy and big data; this is having significant effects, a lot of it invisible, on individuals, as well as broader notions of democracy and freedom of speech and expression. Limiting the consumption of data is seen as one way to manage the manipulation of this personal data. Thus Tactical Technology Collective has a ‘Data Detox Kit’ to help people limit their online data traces (Disclaimer: I worked for Tactical Tech till a few weeks ago, and continue to consult with them part-time). The comparison of data to oil neatly elides the histories of violence that mark the human relationship to oil in particular, and extraction more broadly. The comparison seems to justify how data is to be extracted from people and internet objects, and traded in a similar manner. At the same time, the comparison indicates a shift in the valuation of value itself. Just as the phrase ‘x is the new black’ suggests the dominance of a new metric of fashion, ‘data is the new oil’ implies that we start valuing things as, or against, data. And perhaps the coiners of such phrases know that the standard measures of value, oil and gold, are running out. Brian Larkin. ‘The Politics and Poetics of Infrastructure’. Annual Review of Anthropology 2013. 42:327–43. Online: 10.1146/annurev-anthro-092412-155522. Eugene Thacker. In the dust of this planet: The horror of philosophy vol 1. 2011. Zero Books. The Planetary Futures Summer School is assembling the results of our two weeks together as group and individual projects that will be published in the coming months.